All Kurung Kumey District students union (AKKDSU) alleged the district administration of not maintaining transparency in matter related to the preparation of payment for land compensation for construction of Trans Arunachal Highway (TAH) in the district. Addressing the media person at Arunachal Press Club here today AKKDSU President Bengia Anthony said that many land affected people of the district have made verbal complain and approached them to take up the issue of land compensation with the district administration specially with the Land Record Settlement Officer (LRSO) wherein they suspected that the compensation issue is not dealt by them in fair manner and transparency is not maintained. 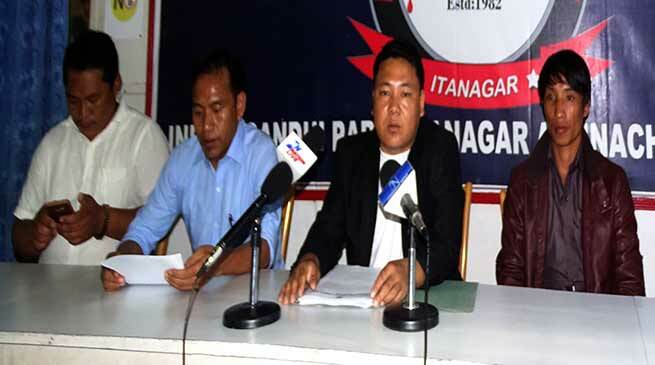 Anthony allege inspite of filing of RTI to LRSO and then to 1st appellate authority ie, DC information and documents have not been furnished to them properly and suspect irregularities while preparation of payment for compensation for the land affected people of Trans Arunachal Highway measuring 61 KM from Guba Tarak to Koloriang in Kurung Kumey district. He allege that the LESO have not given opportunity to the land affected people while land acquisition and assessment and it seems that favouritism have been maintained. He said that proper site survey was also not maintained as informed by the locals. he said. He said that we have no person intention but after several verbal complaint by the land affected people the students union (AKKDSU) have to interfere and demand transparency in the whole process and threatened to take up the issue in the public platform Shorty. General Secretary Phassang Raish also address the media and appeal to maintain transparency in the process right from site verification, assessment, land acquisition to disbursement of payment of land compensation. However this scribe tried to take a reaction of the DC, Koloriang Kanki Darang but in vain.